A bit late getting this one out. 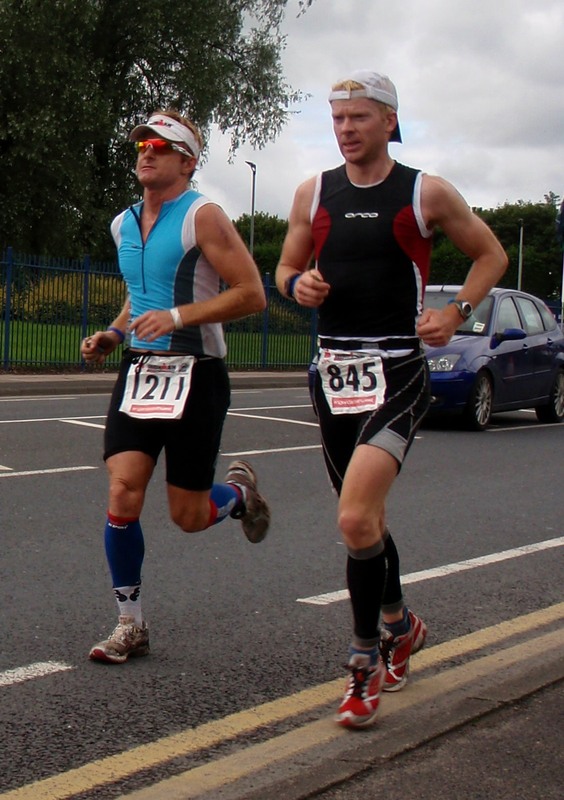 Been a hectic week that included a weekend spent crewing at the Enduroman event in Lichfield over 6-8 August. More in another blog. So….Ironman UK! Well I’ve got my mojo back after Germany, that’s the main thing. It wasn’t the best race, and I wasted time on a couple of issues, but I’m getting back in the game and it’s given me the kick to get back into training once September arrives. To avoid the last minute stresses and fatigued legs I encountered in Germany, I decided to drive up from London on the Thurs prior to the event and book myself into a nice Hotel for a couple of days. I found a place near Manchester airport and a 20min drive from Pennington Flash Lake (swim) and Leigh Sports Village, where registration takes place. This time around there were no major issues with the bike preparation. I’d made a handy bar stem bottle holder to go with the down tube bottle holder, and found a great way of attaching the rear tufo tyre that kept it flush with the aero seat post. A wet and windy day which was annoying because I really wanted to take the Ceepo bike out over Sheephouse lane (the main hill in the race) and down the steep, twisty descent to Belmont. As I’ve said before, the Ceepo is built for straight line aerodynamics and is a bit jittery on corners. And I’m not the most technical rider anyway, especially with a disc wheel. After doing a full drive/recce of the bike loop (3 x 32miles in the race) I took the bike out of the car, did a 2min spin and then decided to call it a day! Returned to the Hotel and decided to go for run. Got completely drenched. Then headed to a Chinese Takeaway to ‘warm up’. The Hotel was quite classy but being an old, listed Mansion house it had some very noisy pipes. The shoulder impingement was also back, just like Challenge Roth last year. So I had to down a few painkillers and lie on the one side to help relieve the throbbing. A short bike ride in the morning and an altercation with an angry bus driver who didn’t like the fact I wasn’t using a rough cycle path off the road, then I was packed and off to rack my bike and transition bags. At 5pm we had the pre-race briefing in the Reebok Stadium, then I met Yve and we went to get some food before heading up to my friend Paul’s flat in Preston. Paul and Yve were my crew for the weekend (!) and they were absolutely awesome….I must have seen them a dozen times during the bike leg alone! After a little warm-up and mobilisation I made my way to the front of the swim and about 20m from the left. In hindsight this was probably a bad decision. When the race started (we heard no hooter) I went hard as usual, and then tried to settle into a decent rhythm. Unfortunately there was a great convergence and I found myself getting squeezed-in. I started to swallow water as I battled through and then inevitably panicked and clambered over bodies to the open left-hand side. It’s not a pleasant experience at all and it wasted a good few mins while I composed myself and slowly brought the effort back in. After that I was quite settled although the drafting was very messy and most of the time I’d find myself alone, or on the feet of someone with no idea what direction he/she was heading in. Plenty of zigzagging. The split times of the Pros were very fast, and the suggestion was a course of only 3500m (300m short!). My 56min time was what I’d expect for a full distance, so I reckon I lost a good 4mins at the start. The Bike course was tough and a bit longer than the official 112miles. It involved an 18mile leg up to the start of the loop near Rivington, followed by 3 x 32mile laps that included a decent hill and plenty of technical road turns. The start of the bike was fine. Except that the bottle on the bar stem mount leapt out after the first speed bump. I couldn’t be bothered to stop and pick it up, so I carried on through the rest of the race with 1 x 750ml bottle on the downtube. I passed a friend Lyle Butler from my local (Teddington) leisure centre about 5miles in, he’s a lifeguard at the pool and a pretty decent swimmer, so I was expecting that. I also had another friend in the event, James Peet, who is a great Ironman triathlete and has a particular talent for the bike – worthy pro-level. I managed to beat him overall at Roth last year but only because I nailed the marathon. I knew that if I didn’t get passed by him until late in the bike, then I was having a good race. I was flying for the first 18miles, feeling really fresh. On the first loop I bombed up the hill, and enjoyed a (non-windy) descent to Belmont. After a sharp turn I was greeted for the first time of many in the day by Team Daz – Yve and Paul. Yve shouted out that I was 26th and 7mins behind Toby Radcliffe (another friend, who races as PRO, and a good target, although much better than me on the day). So I’d moved from 73rd out of the swim to 26th in just 30miles. I was shocked. 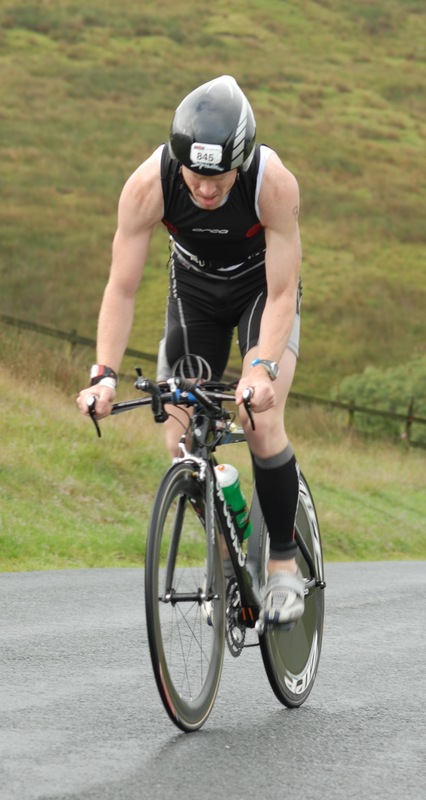 I’ve not competed in an Ironman-branded event before and been so high up the table, even though I was aware of the lower standard at Ironman UK. I now had the incentive to work even harder. If I could gain 47 places in just 30miles, then what could I gain after 112. Never works like that though. I gained about another 4 places in the next 30mins (22nd) before a steam-train flew past of around 8-10 cyclists, all within a few metres of each other and led by none other than, James Peet. He was sporting a very nice green helmet, which certainly helped me track him over the following lap! It was during the rest of the lap I realised for the first time how much difference it makes hanging off the back of a large pack of cyclists. You can still be 7m behind the back of the pack, but gain a huge advantage. I held on to the back of the pack for a few miles, before taking my time over an aid station (remember I only had the one bottle, so I wanted a few mouthfuls from another!). This was a mistake. After refuelling and trying to catch up with them, I was finding it a lot of hard work. If it wasn’t for the hill on the start of the second loop (50miles) I would never have caught them. I’m pretty good at ascending. My power:race weight (70kg) and light bike mean I can usually fire past most other cyclists, and it was fun overtaking the train, that was now smashed all over the hill. Unfortunately this was the last time I saw the green helmet, which bobbed over the crest of the hill a few mins before I got there. My nutrition strategy this time around was slightly different. I’d increased my solid intake. I’ve never had a problem with energy bars on the bike so I decided to take advantage of this and eat 1 every 60mins, as well as a gel and rotated water/electrolytes from the aid station. It wasn’t perfect of course. Normally Id wash down foods with water and drink carbs separately. But with just one bottle on the bike I couldn’t do this. I’ve not had stomach issue before now so wasn’t too worried. I started getting a bit lazy for the rest of lap 2 and 3. I had no-one to really chase down. I had to take a pee-break on lap3 (well I wasn’t going to do it over my new white saddle!) and it lasted a whole 60secs. With the slowing down and speeding up that’s close to 2mins lost! That’s a lot when you’re racing for positions and I dropped 4 places from 24th to 28th. I felt a lot lighter (!) once I jumped back on the bike and kept myself amused by working my way back through those 4 cyclists and my 24th position. It also makes you wonder just how much you have in the tank and whether you can go a little harder overall….but it’s a fine line, and once you’ve crossed it, it can bite hard in the marathon. At the end of the last loop and turning on to a 2mile ‘dog-leg’ downhill to T2 (A sports hall/tennis court at Rivington School) I almost went into the back of three cyclists and a motorcycle. The first two were male, the one in front was a female (all in pink) with a motorcycle film crew. This was Bella Comerford, one of the UKs best PRO females and leader of the race at that point. She must have been suffering because the pace seem very slow and I was keen to get by. The motorcyclist and cameraman would not give an inch though and there was traffic coming from the opposite direct. I shouted out something to them but it made no difference and I was actually very close to budging past them, although I didn’t want to come across as an arse on what might have been TV viewing. I bided my time, and then shot through bike racking and T2 (2mins). According to the live tracker I was 28th after the bike so I must have lost a few more places on the last loop, unless the time was taken after I shot into the bushes at the start of the run for pee no.2! I’m not having any of this “it was the correct length” or “it was a little short”. Lets face it, it was very short, and by more than a mile. You don’t get that many guys going <2:55 in an ironman marathon on a bumpy course. I must have spent 5mins on toilet break, and definitely went through a bad patch in the final third from stomach problems. 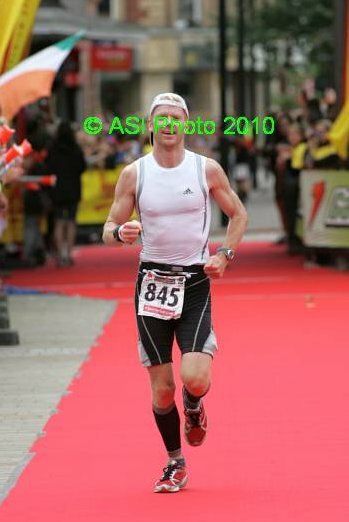 In Roth I sustained a decent pace all the way through, on a quickish course, and was only min quicker in 3:08. I’ll admit I’m a bit gutted I didn’t take the opportunity to record an ‘official’ <3hr IM time when I had the chance, but hey! So, after my brief stop I was on to the run proper and trying to catch Bella and another guy who was going at a fair pace when he passed me just outside T2. Bella had her motorcycle film crew buddies all the way through the forest, over mud and tree-routes, they wouldn’t leave her alone! Funnily enough she popped behind Paul’s car later in the race to take a toilet-break and said to Yve that she was glad to get a break from them even for a few secs. While running through the woods I first passed Toby Radcliffe, and then James Peet just a minute or two after, coming the other way. Both were in good spirits. It was a small loop rather than an out and back, but I reckon they had a good 10-12min lead on me. The most annoying thing for me on the run was the lack of mile markers (actually there were none!). I am very much a pacer – I need to keep myself amused with figures and have mini targets to work to. I did have my Garmin, but the first 3miles were a loop through a wood, which rendered it useless. Once out on to the road I started to pick the pace up again. I’d had no choice but to run in the Newton Gravity having soaked my cushioned trainer choice in the run on Friday night. I passed a couple of other males runners and latched on to the guy I mentioned earlier, who was running the kind of pace I could comfortably handle. His name was Fernando Tuya, he was in my age-group and was also competing for a Hawaii slot. We agreed to work together for as long as possible and reel in some of the competitors in front of us. Ok, we were going to have to try to beat each other at some point, but it was a lonely race (clear for 800m in front and behind to start with) so this was an amicable solution. I passed a few friends and tritalkers on the way including Pookey, CarlJ, Graham O, Rooster, as well as Yve and Paul a couple more times. The support was awesome, the best I’ve seen for a UK ironman event. Rooster was allegedly (it may be classed as outside assistance) giving us updates which was useful, particularly those that had blown on the run course and how our fellow age-groupers were doing. After the first turnaround (10-11miles) just before what would be the finishing straight, we started heading back the way we’d come and passing those behind us. We were now in 16th (3rd AG). Fernando was telling me about a couple of his friends. One was a leading AG and another (our AG) a solid runner, who we spotted just 2mins after the turnaround. We had 4mins which he reckoned would be enough. But I wasn’t so sure and wanted to increase the pace again. Fernando started to struggle on the pace and uphills so I decided I’d break him now rather than later and got my head down. 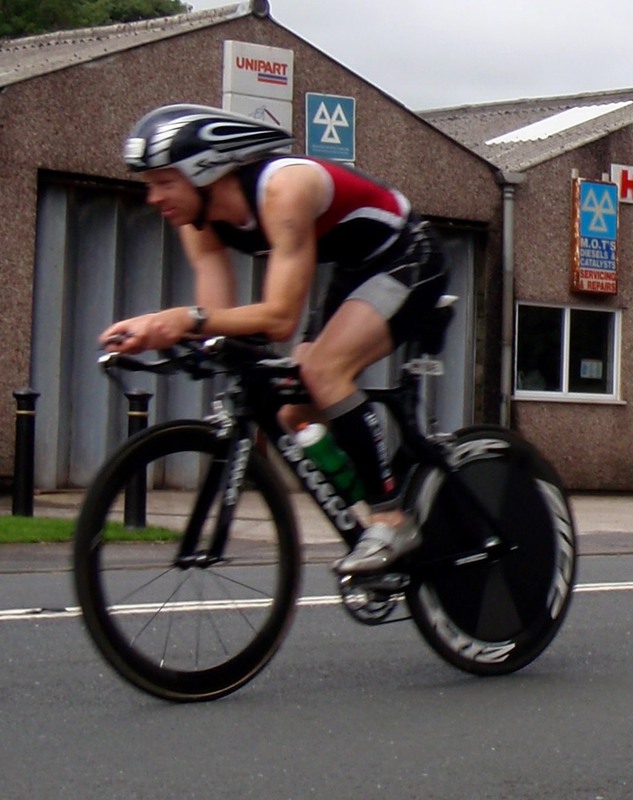 I passed Craig Twigg (PRO) on the way, who was having a chat roadside with Richard Jones (who beat me by 14mins at Roth and set Welsh IM record in the process). From the time it took to pass them I made out that he’d blown but decided to get around the race. Fair play to him, I now know how hard that decision is. After leaving the canal path on 15-16miles I started to get pains in the stomach, something I’ve not had in an IM race before. I train myself to handle all sorts of foods in and around training – training the stomach if you like! I swallowed plenty of Pennington Flash in the swim (Paul works for the Environment Agency and I’m not sure I was happy to learn what they found in the lake tests!) so that may have had something to do with it. But then, my nutritional strategy was a little all over the place too. Who knows! Fernando’s mate went by at this point and took my 3rd AG place. I looked at him and thought; hey I can go at that pace quite comfortably. I decided to keep him within distance and then make ground on the return descent. With just 1-2miles before the final turnaround point the crowds were picking up again and I spotted Yve roadside. I decided to take off my outer/tri-top so I wasn’t as restricted and just run in my new adidas top. This was a mistake. The adidas top was saturated and, with the cool breeze, I started to get a chill around the core which exasperated my stomach pains and I really needed the toilet. As has been mentioned by others, the toilets on the run course (like the mile markers) were almost non-existent. I asked a couple of marshals on the way but they didn’t know of any. I was getting desperate. I didn’t want to have to go in and out of pubs or restaurants hoping there was a vacant toilet, but at the same time I had images of a guy running down the finish line with *** down his legs. I reached the turnaround and asked again. One of the marshals said they had their own portaloo just off the course, so I shot in just before the timing matt. I still have to check how much time I lost but I reckon somewhere between 3-5mins. I just hope they had some white/red ribbon handy! After leaving the portaloo and going over the timing matt (to some strange ‘where’d he come from’ looks from the crowd) I could see Fernando and two other guys in front of me further down the road. The stomach pains had gone and I was a lot lighter (!) but I felt empty, there wasn’t a lot of energy left. I knew this was because the stomach hadn’t been absorbing the cals so I made an effort to walk through the next aid stations and get something on board. Miles 18-22 were tough. My pace had slowed right and I wasn’t a happy bunny. I was started to get on board a little carb liquid and coke though, which helped. My pace back along the canal was contained, and I jog/walked up the final steep hill to take us back on the road. I overtook one guy, but another (in blue) was unreachable. I was also starting to close in on Fernando again. We exchanged a few comments, and then I moved on. Rooster thought I was in 3rd AG again but didn’t account for the Spanish guy who overtook me just before the last turnaround. With just 2miles to go to the finish I felt awesome and really picked the pace up to a sprint (in IM terms only!). 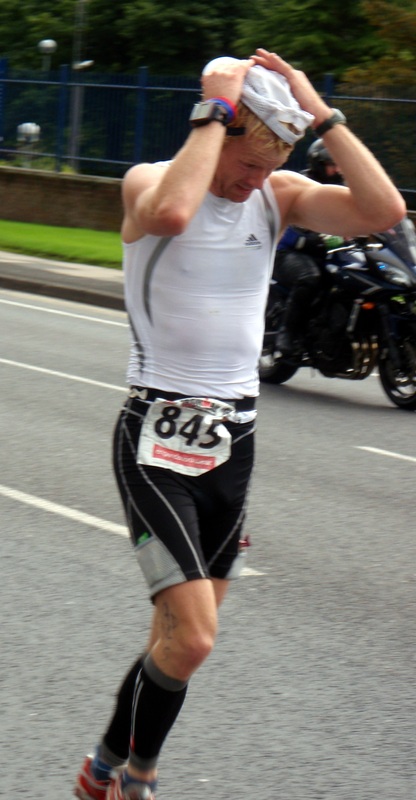 I passed Wiganer (tritalk) and the Slackos as I approached the finishing straight to cheers from an awesome crowd. 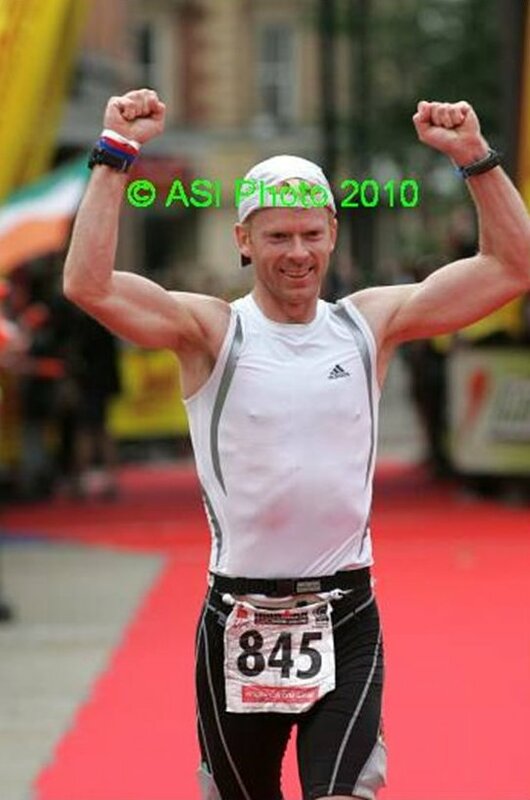 You have to love the finish of an Ironman! 19th Overall and 4th in AG. After receiving my medal I asked to be checked out by the medics just to make sure everything was ok (they were all sitting around waiting so I don’t think I was imposing!). Everything checked out and they warmed me up with soup and a foil quilt-thing. I was quite light-headed when I left and I should have eaten straight away from what Lyle told me was a banquet buffet in the main hall. After meeting up with James Peet (who beat me by 2mins – top work fella), I headed off with Yve and Paul to find food. Took a good 1hr+ to find a Wetherspoons and by then I was struggling. I ate a couple of chips but it wasn’t staying in the stomach so I gave up the fight and we headed back to Paul’s. Another night of shoulder pains but I was so wasted I still managed a good 6hrs. The hunger was also returning and I nursed myself back with toast. On Monday we packed and headed back to the Reebok Stadium and the medal ceremony. We sat down at the same table as James, Toby and Yvette Grice (ladies winner). James came 3rd in his AG but missed out on a slot. I also missed out on a slot, as well as a trophy. But tbh I didn’t really mind. Hawaii is just another (expensive) Ironman to me. If it wasn’t in such a beautiful location, I would probably never go, and I’m sure a lot of other people feel the same way. If I’m offered a place in the future then yes I will take it (funds allowing), but it will only be once, and it’s more for the experience and location than the race. I’ve also had a think back to the race and how the dynamic makes such a huge difference. Losing that large group of cyclist on lap1 was probably the clincher between 19th and a position a lot further up. I may be changing my bike at some point or going back to the Argon which I’m mush more comfortable with. I’ve also come to an arrangement with Blue70 and hope to have an Axis wetsuit in the near future to replace the older Blue70 Energie I have. Let’s see if this helps the swim. I have a strange 1-2 months lined-up where structured training will be a problem. I have just spent a weekend crewing at Enduroman UK (which tired me out), and have a 2-week camping hike from this Saturday over the West Highland Way and Great Glen Way with my brother. Once I’m back I’ll be starting-off some new coached clients and looking towards a couple of ultra runs. The first will be a personal experience. Unassisted over either Offas Dyke again or the Cotswold way. 100miles at least I hope. The next will be the Brecon Beacons Ultra Race in November. So near n yet so far, but a great race, pity about stomach. Nice account mate. A top-20 Ironman finish is definitely not to be sniffed at! You’re very welcome to have a spin on my bike if you want to compare against the ceepo. Impressive result and sounds like a solid race overall. Amazing to come in the top 20 and not be taking a Kona slot though! Great work and great race report! Stumbled onto your blog last month and really enjoying your exploits. Cheers from a Twickenham-local and ceepo owner! Hi Martin, Cheers. Blimey, can’t be many other locals with a Ceepo….I’ll keep a look out at Richmond Park!